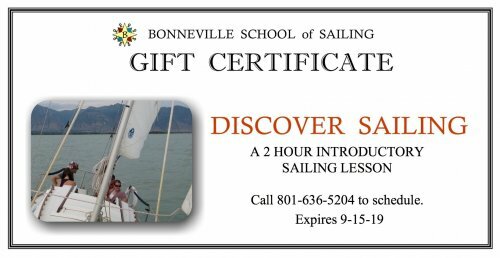 Get a Gift Certificate for a FREE Sunset Sail with the purchase of our Basic Learn to Sail course. 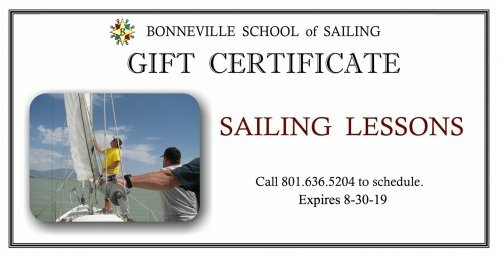 Bonneville Sailing would like to help make your Christmas shopping easy and meaningful this year. Some folks like the challenge of crowded malls and driving on slippery roads in search of that unique gift. Why not just stay at home and simply select a customized sailing gift from our many fun and rewarding courses. Our special holiday rates are good until December 24, 2018. Request a gift certificate from the offerings below, or give us a call for your own specialized custom package. You can have a gift certificate e-mailed to you without even having to scrape your windshield. Give the gift of self confidence, adventure, relaxation and enjoyment, that only sailing can offer. Utah's most creative date night! A great way to celebrate an anniversary or birthday. "Wonderful way to spend the evening. It was so relaxing and we thoroughly enjoyed it." "Loved it! Thank you for a fabulous evening." What a fun, relaxing, perfect evening. Beautiful views on every side and wonderful company. This was an excellent way to spend an evening on our anniversary. Thank you! (And the dessert was yummy!)" 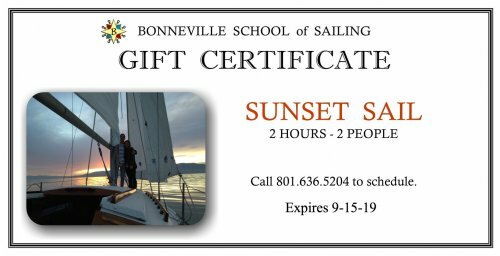 Get a Gift Certificate for a FREE Sunset Sail with the purchase of lessons. You can give it as a gift or keep it to share with that special someone. BASIC COURSE - 18 hours on-the-water. Take the tiller and start sailing with the first lesson. Call Louise at 801-636-5204 to purchase.